D ublin is a city that truly captures your imagination. Cobbled alleys, Viking remains, Georgian squares. Dublin’s history goes back over a thousand years. Step back in time in this city full of literary landmarks, from the James Joyce Centre to Trinity College, alma mater to many of Ireland’s great past and present writers and poets. Dublin is a medieval city where an abundance of museums and art galleries chronicle its long and colourful past, while the pubs and cafés buzz with traditional and contemporary entertainment. Their contents are priceless, but entry to Dublin’s top museums and galleries is free. That means you could skip from bog bodies at the National Museum of Archaeology to canvases by Caravaggio and Jack B Yeats at the National Gallery or you could check out four centuries of furnishings at the National Museum of Decorative Arts and History. Located in the most prestigious address in the city, The General Post Office, O’ Connell Street, the Witness History experience tells the story of events of the 1916 Easter Rising from the witnesses perspective – from active participants on both side to bystanders caught in the middle. It was this event in Irish History that lead to the civil war some years later. A story of the birth of a nation and of the times in which the world was at war. Located in the heart of Dublin City, a walk through the cobbled stones of Trinity College Dublin will bring visitors back to the 18th century, when the magnificent Old Library building was constructed and which displays the Book of Kells. The Book of Kells is Ireland's greatest cultural treasure and the world's most famous medieval manuscript. The 9th-century book is a richly decorated copy of the four Gospels of the life of Jesus Christ. Dublinia tells the story of the Viking and Medieval history of the city. Dublinia is located in a part of Dublin's Christ Church Cathedral, known as the Synod hall. With four exciting exhibitions visitors will experience archaeology as a History Hunter and climb the medieval St Michaels Tower. 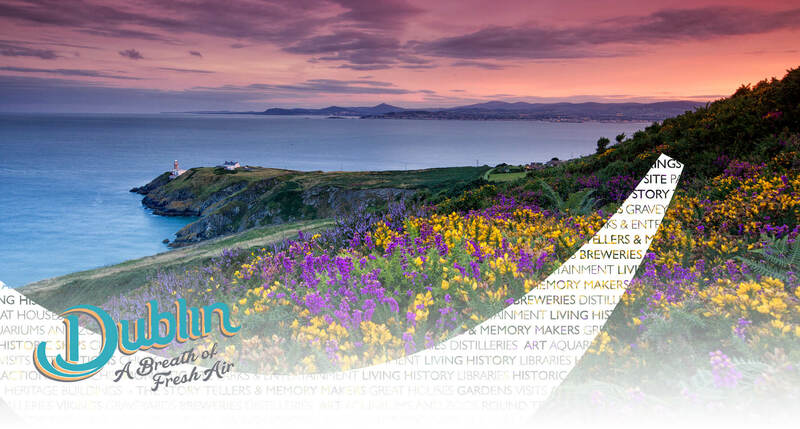 At Dublinia see Dublin from a new perspective and come away knowing more about its citizens throughout the ages. Malahide Castle, parts of which date to the 12th century, lies, with over 250 acres of remaining estate parkland, close to the village of Malahide, nine miles north of Dublin city centre. Home to the Talbot family for 800 years the Castle visit and tour tells their story and the castle life. The walled Garden which was restored and opened to the public in recent years is a wonderful visit and complemented with Avoca restaurant and retail experience. There are acres of parklands to enjoy and all this so accessible by DART in the nearby picturesque seaside village of Malahide. Getting to Dublin is a breeze. Dublin Airport is one of the busiest in Europe, with hundreds of daily flights providing a huge range of options to get here. Want to bring your car or campervan to Dublin? Simply prefer the comfort, convenience and baggage freedom of ferry travel? Or perhaps you are arriving on a cruise liner? Dozens of routes serve two ports in the city.